This is Stijn Oom, a 14-year-old kid from the Netherlands. Stijn started to play with Lego right after he was potty trained (literally). Just a short time later, he's a certifiable Lego genius. 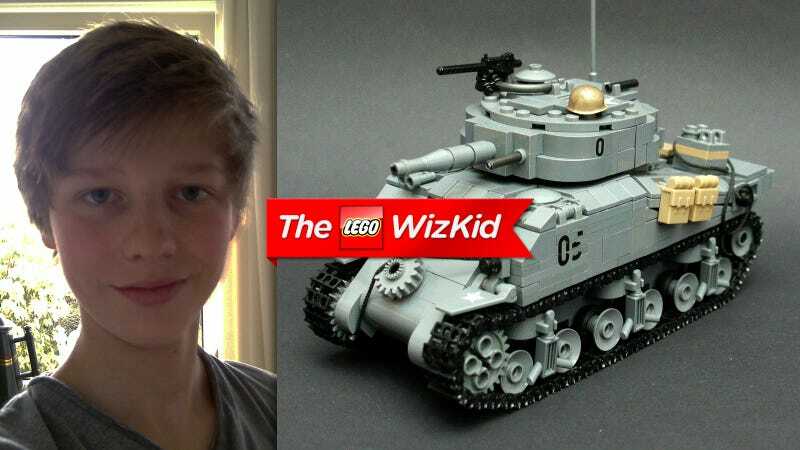 He builds the best Lego tanks I've ever seen. The accuracy and precision is uncanny. His sense of design, the way he captures the details, impressive. This is his story, and these are his creations. "I'm Stijn and i'm 14 years old, I live in Holland. I am quite fond of WW2 and I love LEGO," he tells me in an email interview. He started out just like any other kid: "I think most people still remember the first time they got a Lego or Duplo model. The first time for me, was when I did Doo-Dooon the toilet for the first time by myself. My parents bought me the yellow excavator, from the Bob the Builder sets. I loved it. From that point I started to collect Duplo. Almost every Christmas, ‘Santa' got me a Duplo set." When he turned five, he started to build with actual Lego. For that birthday, he got one of the old Creator sets. But—more surprisingly—at that early age he also began making Lego Technic sets. These are made for 14 year old kids and older. Technic is quite complex. Too complex for a five-year-old. But not for Stijn. Clearly, he was born for this. About a year-and-a-half ago, I looked around on Google because I wanted to build a tank. I wanted to build one because I wanted to get the treads Lego produced. So, i looked around, and found some WW2 tanks on Flickr. He was hooked. He loved the aesthetics. He loved the complex vehicles, the scenes. It was a new and amazing world for him. This is when he learned advanced building techniques: "when I discovered Flickr, I found out that there was a HUGE Lego community going on! Reactions on builds, comments, favorites! It was the perfect system for every young builder." Flickr is used by Lego fans to share their creations. They like it especially for its image annotation abilities, which allows them to highlight details and comment on them. He joined the website, started to post his creations and garnered positive response from the community almost right away. More importantly, he gained knowledge. "I learned new techniques from other builders," he says. They taught him new techniques and he "became better and better." Quickly, he learned it all. Using standard Lego pieces, he started to create his very own designs from scratch based on real world WW2 armament and battles. Soon, things began to look amazingly good, like you can see in these pictures. His designs became extremely accurate and intricate, yet elegant and simply resolved. Believe me, it requires some strong abstraction powers and imagination to turn the complex shapes of a vehicle like a Panzer or a Hellcat into a perfect Lego model. Just one year later, he's one of the most accomplished builders in the world, respected by his peers and well known among fans of World War II builders. His models are so damn good that they can pass for official sets. But Lego doesn't sell military sets. It's part of the company DNA—unless they are laser guns, like the Star Wars sets, the Danish company doesn't manufactures guns or military minifigs. For those little details Stijn has to order from Brickarms.com, an online shop that uses the same Lego molding techniques and plastic to produce tiny plastic machine guns, pistols and minifig with uniforms. Only these tiny details are not from Lego. The rest is just the standard stuff you and I can buy at any store. Stijn even takes these great photos: "I photograph myself, with my mothers camera. It's a Sony cam, and works absolutely superb! I use a black paper as background most of the times, and edit the pictures with picmonkey." Well kid, you are doing an awesome job. Here's hoping you get hired by Lego soon! For more of Stijn's creations, check out his Flickr page.